U.S. crude prices rose in 13 of last month’s trading 21 sessions, while London was up in 13 of the 22 trading days. However, most of the gains were moderate, and the drops more severe. Brent lost nearly $11 over three sessions spread throughout the first four weeks of July. U.S. crude lost almost $8 over as many days during the same period. A final day of heavy losses last Tuesday left both markets with their worst monthly drop since July 2016 with London futures trading at close to $79 a barrel in late June and ending up around $73 at the beginning of August. Several of the down days clearly were due to comments from the White House such as on July 2nd when the President announced on Twitter that Saudi Arabia’s king had agreed to pump up to 2 million more barrels per day to tame fuel prices. A new market assessment from S&P Global Platts concludes that two-year production highs from Saudi Arabia and other OPEC producers are more than offsetting declines from Iran, Libya, and Venezuela. According to Platts, production from Iran last month averaged 3.72 million b/d, its lowest level in a year and a half. US sanctions on Iran have hit its oil sector, and some European customers are already curtailing purchases of Iranian crude. Libya’s production average of 670,000 b/d in June was its lowest since April 2017 as Africa’s largest producer struggles with national security problems. Venezuela, meanwhile, is coping with what the International Monetary Fund said was a “profound” economic crisis and aging infrastructure, pushing oil production to the lowest level since Platts started keeping track 30 years ago. Outside of Saudi Arabia, meanwhile, Kuwait and the United Arab Emirates produced the most oil since December 2016, the month before OPEC and other non-member states, including Russia, agreed to curtail production to balance an oversupplied market. US Shale Oil Production: The most interesting news of last week came when the EIA published its revisions to US oil production for May revealing that US crude output actually fell by 30,000 b/d during the month rather than increasing by over 100,000 b/d. The monthly total of 10.442 million b/d for May is considerably lower than what EIA itself thought at the time. EIA weekly estimates for May have production increasing from 10.703 million b/d in early May to 10.769 million at the end of the month. The weekly assessments are known to be less accurate than the retrospective monthly numbers. That involves a lot of guesswork. Yet, the discrepancy is a major one. Not only did the EIA estimate that production in April and May was much higher than it actually was, but the agency also thought production was rising quickly. If the weekly estimates were to be believed at the time, production would have climbed from 10.525 million b/d in early April to 10.769 million b/d by the end of May, an increase of 244,000 b/d over an eight-week period. The main reason for the decline in overall US output was a 75,000-b/d decline in production from the Gulf of Mexico. But Texas production only rose by 20,000 b/d, a figure far below what the EIA and most analysts had expected. It has been known for some months that rapidly increasing production from the Permian Basin was running into troubles. Most of these troubles concern shortages of pipeline capacity to move increasing quantities of oil and gas production to market. While new pipelines are under construction, it will be another 18 months to two years before the capacity problem is mitigated. The basin also is seeing increasing costs of production, shortages of labor and limited capacity to rapidly frack newly drilled wells. This is leading to a large increase in drilled but uncompleted wells in the Permian. A more subtle problem is the issue of whether developers are running out of the most productive “sweet spots” to drill in the Permian. While the EIA continues to tell us that newly drilled wells are producing more oil in the first few months than ever before, some observers note that these more productive wells are considerably longer and more expensive to drill than those being brought online a few years ago. At some point, albeit months, years, or decades away, the cost-effective places to drill for shale oil will be gone and the great US shale oil boom of the early 21stcentury will be over. 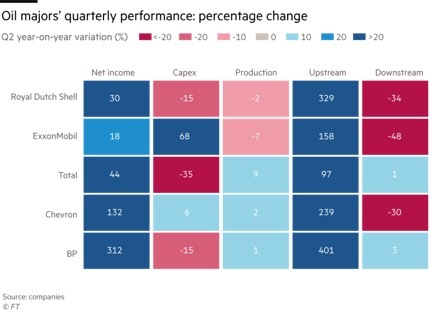 Most forecasters still see rapidly increasing production from the Permian Basin as the key to sustaining global oil production in the face of severe declines in capital expenditures on finding and developing new sources of oil elsewhere in the world. Other US shale oil fields are believed to be at or close to peak production and are no longer capable of significant growth. While there have been several large new deepwater discoveries in the last two years, these discoveries are many years away from producing large quantities of oil and global demand for crude still seems to be increasing at the rate of circa 1.5 million b/d each year. It is still too early to tell if the unprecedented increases in production from US shale oil fields that we have seen in the last ten years is coming to a close. If monthly US production figures continue to fall substantially short of expectations, that would have serious global ramifications. The oil market could end up being a lot tighter than we all expect and oil prices could be considerably higher. Iran: President Trump said last Monday he was willing to meet the leaders of Iran without any preconditions, opening the door to possible negotiations with Tehran. Senior Iranian officials and military commanders replied on Tuesday by rejecting President Trump’s offer as worthless and “a dream,” saying his words contradicted his action of re-imposing sanctions. Iranian President Rouhani added that Trump’s repudiation of the international nuclear deal was “illegal” and Iran would not readily yield to Washington’s renewed campaign to strangle Iran’s oil exports. An Iranian naval commander again threatened hostilities by saying, “The cruel sanctions being imposed on Iran will affect the Strait of Hormuz functions.” The US says Iran has started carrying out naval exercises in the Gulf, apparently moving up the timing of annual drills due to the heightened tensions. The issue now is which oil importers will follow Washington’s demands and stop or cut back on purchases of Iranian oil. US officials are attempting to persuade Washington’s allies to suspend imports of Iranian crude, but analysts doubt the push will be ultimately successful, as Iran’s return on international oil markets provided a welcome diversity of oil supplies for buyers from Asia to Europe. Beijing already has declined the request by US officials to stop importing crude oil from Iran; however, the critical question is whether the Chinese are willing to increase their imports of Iranian oil to make up for any loss of sales to other countries. Ahead of the impending US sanctions, India’s state refiners boosted their Iranian oil purchases, pushing up Indian oil imports from Iran by 30 percent from June to a record 768,000 b/d in July. Iran is also said to have started to offer Indian cargo insurance for tankers operated by Iranian companies as some Indian insurers have refused to cover oil cargoes from Iran in the face of the returning U.S. sanctions on Tehran. However, Indian oil refiners reduced their orders for Iranian crude oil in June by 12 percent compared to May. Some large Indian refiners worry that their access to the US financial system could be cut off if they continue to import Iranian oil, and have started to reduce purchases. It will be several months before we know how this confrontation turns out. In the meantime, Iran’s economy is not doing well, and Iranians are taking to the streets in protest. The country’s currency hit another record low against the US dollar last week on concerns about new American sanctions. The rial traded at 119,000 to the US dollar last Monday and has almost halved since early May. Iranian officials clearly are concerned with the head of the Central Bank saying “Enemies are out to destroy the country’s assets and instill disappointment in public through sanctions.” Over the weekend sporadic protests took place in several cities. Iraq: Iraq’s oil exports hit an annual high in July as the country sold 3.87 million b/d – an increase of more than 70,000 b/d compared to June. Baghdad exported 3.54 million b/d via the Basra Gulf, earning $7.597 billion – its largest monthly revenue figure since July 2014. All the oil Baghdad shipped in July came from the southern fields. and there were no exports during the month from the Kirkuk fields, located in northern Iraq but under the control of the federal government. Protests continued around Basra last week, as demonstrators threatened to shut down all roads leading to the super-giant West Qurna 1 oil field. Outraged protesters have flocked back to several oil sites in Basra following a message Friday from Grand Ayatollah Ali al-Sistani, who encouraged his followers to express their displeasure about the Iraqi government’s failures to address problems of corruption, unemployment, and lack of basic services. As protests spread in southern Iraq, there have been renewed demands for autonomy for the governorate. The concept of autonomous regions is a thorny issue among Iraqis, many of whom resist the idea of the division of Iraq. However, it may be argued that calls for an autonomous Basra governorate are merely an attempt to pressure the central government to disburse the governorate’s budget allocation and provide better services. Basra is economically the most important province in Iraq, the third largest governorate with a population of more than 1.5 million people, situated between Iran and the Gulf states. The governorate contributes a major part of Iraq’s federal budget. In June 2018, the central government exported 105 million barrels of oil from Basra, which produces 2.8 million barrels on a daily basis. However, the governorate’s residents do not benefit much from the revenue. Saudi Arabia: The Aramco IPO was put on indefinite hold several weeks ago, but Saudi Arabia’s funding needs have never been greater. Now Crown Prince Mohammed bin Salman has come up with a scheme to raise tens of billions for the government by forcing Aramco to issue debt to buy a controlling stake in a petrochemical company from the country’s sovereign-wealth fund. Should the deal go through, it would give the Public Investment Fund (PIF) between $50 billion and $70 billion for all or part of its stake in Saudi Basic Industries, or Sabic. Controlled by the state, Sabic is also the country’s largest publicly listed company, with a market cap of about $100 billion. The Aramco IPO with its required disclosures would have shed light on the inner workings of the company for the first time since it was nationalized in 1980 and lead to the independent verification of its oil reserves and other assets. It would be a significant step in unmasking the murky world of national oil companies, whose reserves are thought to represent 90 percent of global reserves of oil and natural gas according to one estimate. Some are saying that an international sale of bonds to finance the purchase of the Sabic petrochemical company would also require disclosure of the company’s financial information, but many doubt the new scheme to finance the Saudi government will ever take place. The impending Sino-American trade war continues to be one of the world’s top issues. Last week US President Trump sought to ratchet up pressure on China for trade concessions by proposing a higher 25 percent tariff on $200 billion worth of Chinese imports. US Trade Representative Robert Lighthizer said Trump directed the increase from a previously proposed 10 percent duty because China refused to meet US demands and has announced retaliatory tariffs on US goods. On Friday, China proposed retaliatory tariffs on $60 billion worth of US goods ranging from liquefied natural gas (LNG) to some aircraft, as a senior Chinese diplomat cast doubt on prospects of talks with Washington to solve the trade conflict. China’s proposed tariffs on US liquefied natural gas and crude oil exports opens a new front in the trade war. China included LNG for the first time in its list of proposed tariffs at the same time that its biggest US crude oil buyer, Sinopec, suspended US crude oil imports. The first official data reflecting the impact of US tariffs on China’s economy was released last week with surveys of factories and service providers pointing to sluggish domestic demand. The official manufacturing purchasing managers’ index fell to a five-month low of 51.2 from June’s 51.5, slightly lower than economists’ expectations. The import sub-index of the PMI slipped to a 23-month low, while the export sub-index held steady thanks to a weaker yuan. An official measure of activity outside China’s factory gates, also released Tuesday, declined to an 11-month low in July, as cooling manufacturing and construction activities weighed on the sector. A meeting of the Politburo last week highlighted the challenges Beijing faces. Without mentioning the trade conflict with the US, a statement issued after the meeting made it clear that the dispute is a threat to China’s growth and stability. Russia’s crude oil and condensate output during July rose by 148,000 b/d, to 11.215 million b/d, in line with Russia’s pledge to boost output under the OPEC agreement. Under the original deal in force since January 2017, Moscow had agreed to cut 300,000 b/d from its October 2016 output of 11.247 million b/d. On Wednesday, Energy Minister Novak said his crude and condensate output in July was 40,540 b/d below the October 2016 level. The October 2016 level of 11.247 million b/d came as the result of an unusual monthly surge in production from 10.7 million b/d meaning that after the supposed “cut” Moscow’s production was still close to pre-agreement levels. Production may remain around the 11.2 million barrels a day level for the remainder of the year, a government official said, citing the oil ministry’s most recent calculations. Supply could even increase if there are further agreements with OPEC+ to change current output policy and boost supplies, though there haven’t been any detailed talks on this yet. OPEC+ may discuss whether a bigger production increase is needed when they meet in September, Novak said last month. Between March 2017 and March 2018 the Nigerian National Petroleum Corporation incurred a loss of US$663 million as an under-recovered expenditure in importing gasoline at the international market price and selling at the federal government’s regulated pump price of $.40 per liter. The report, which showed that 80.26 million liters of gasoline were consumed in March 2018, also indicated that in February 2018, Nigeria’s oil production volumes declined by about 7.588 million barrels on account of many production shut-ins mostly on crude oil export terminals and pipelines. The Minister of State for Petroleum Resources says that new and upgraded oil refineries in Nigeria would place a lot of demand on the country’s oil production, so that it may find it difficult to meet the needs of the soon-to-be-completed refineries. The imminent recovery of refining capacity of the four refineries owned and operated by the Nigerian National Petroleum Corporation is part of the expected pressure on the country’s oil production which is currently around 2.3 million b/d. Government’s statistics had indicated Nigeria currently has a 445,000 b/d refining capacity in the NNPC’s four refineries. This number is however projected to rise with the coming on stream of refineries such as the 650,000 b/d Dangote refinery; the Omsa Pillar Astex Company (OPAC) refinery in Delta; as well as the 12,000 b/d Azikel refinery, amongst others. At a recent meeting in Abuja, where Nigeria and Niger Republic penned agreements to build a 150,000 b/d refinery in Katsina, the Minister predicted that Nigeria could have challenges providing crude oil for the refineries when they all become operational. According to the Miami Herald, a US probe into the laundering of $1 billion from Venezuela’s state-owned oil company PDVSA has involved President Maduro. Although Maduro was not named in the criminal complaint filed earlier this month, the president along with other senior Venezuelan officials are being investigated for their alleged participation in the scheme that involved channeling hundreds of millions of dollars from PDVSA into US and European banks. Maduro didn’t say that gasoline prices would be increased but warned that people who don’t take part in a nationwide car census that began last Friday would not be eligible to receive state subsidies for gasoline. It sounds a lot like rationing of that one cent gasoline is on the way.